Tonight we lay our heads in a place called Erldunda which is situated at the junction of the Stuart Highway (road between Adelaide in the south and Darwin in the north). Erldunda claims to be in the centre of the centre of Australia. 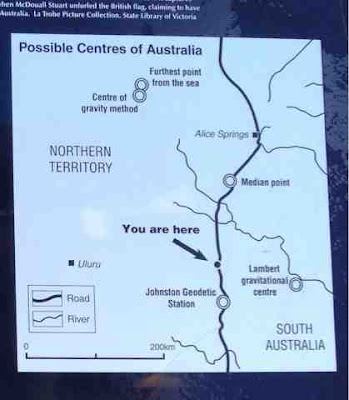 Apparently it is difficult to determine 100% where the actual centre of Australia is. There have been several studies the determine it but each one has come up with a different location. But Erldunda is in the centre of the locations determined. 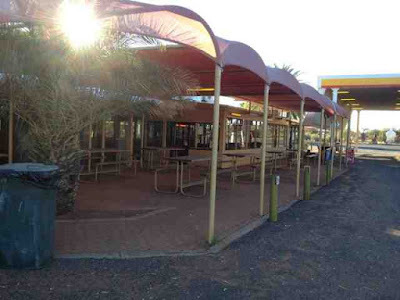 The caravan park we are staying at is called Desert Oaks Motel and Caravan Park. It was established in 1979. 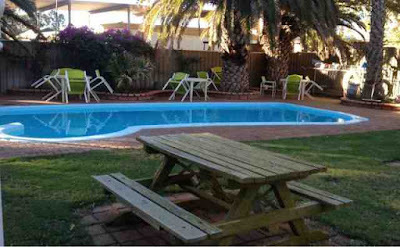 It has grown from a one pump petrol station to a resort now with motel, backpackers, caravan park, tavern, take away and supplies shop, tennis court and pool all covering 20 acres. But it us in the middle if nowhere, just surrounded by Central Australia red dirt. OK where is the centre of Australia??? Red clay eh? Just like Prince Edward Island here in eastern Canada....all red clay.